The days have gotten shorter, the wreaths and lights are going up around the neighborhood, and this week I finally broke down and pulled out our basket of hats and mittens for the cold weather; it feels like winter! In the summer we have tons of friends and family visit us — living by the beach lures them in! 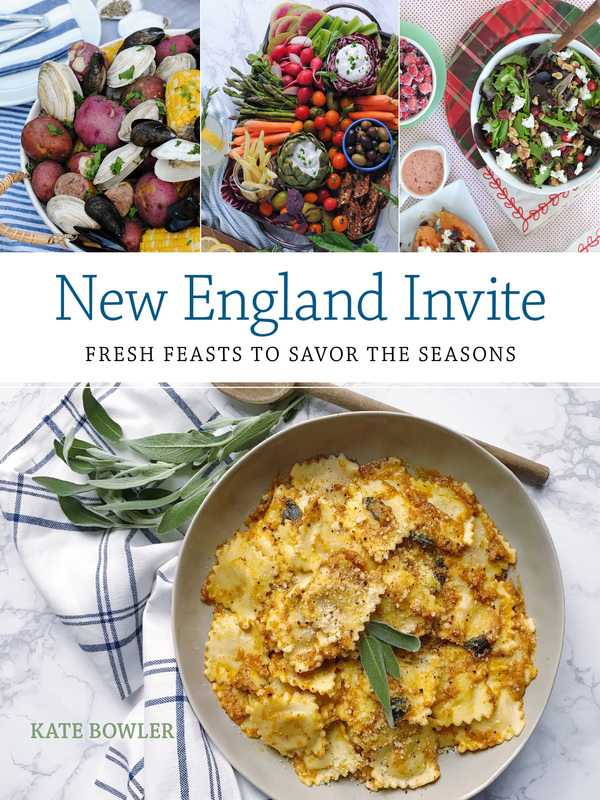 When we have friends and family stay for the weekend this time of year though, I find that we spend a lot more time cozied up inside our house enjoying slow mornings full of brunch and pajamas and lounging on the couch. 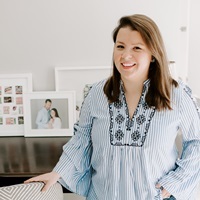 Given that we spend a bit more time at home during these chilly holiday weekends, I’ve been brainstorming fun ways to make our mornings with houseguests a bit more special. Putting out a help-yourself style coffee bar is one of my favorite ways to make my family feel welcome when they stay over. 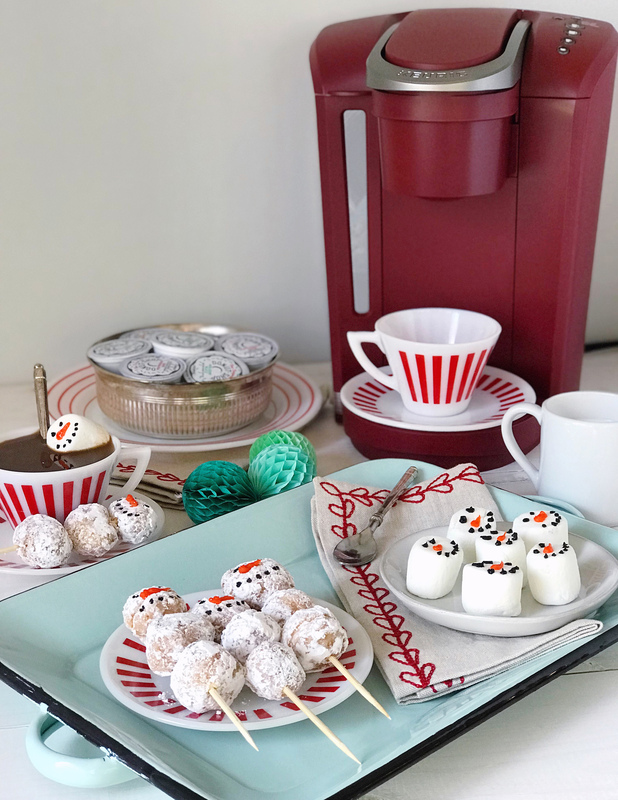 To dress up my Keurig® coffee station for the holidays (and maybe even a few cozy snow days) I gave it a winter-inspired update. 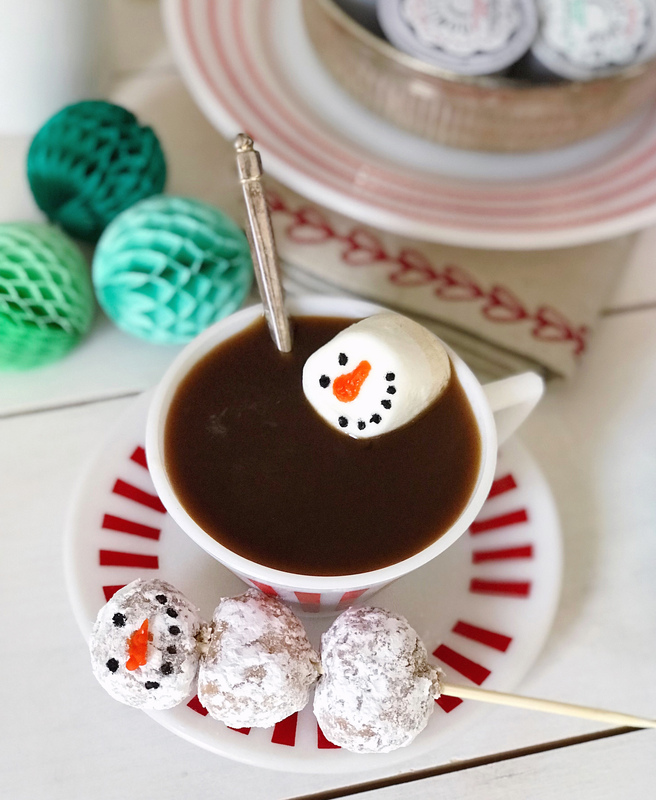 I started with some seasonally flavored brews like The Original Donut Shop® Peppermint Bark coffee and Holiday Buzz® coffee K-Cup® pods. 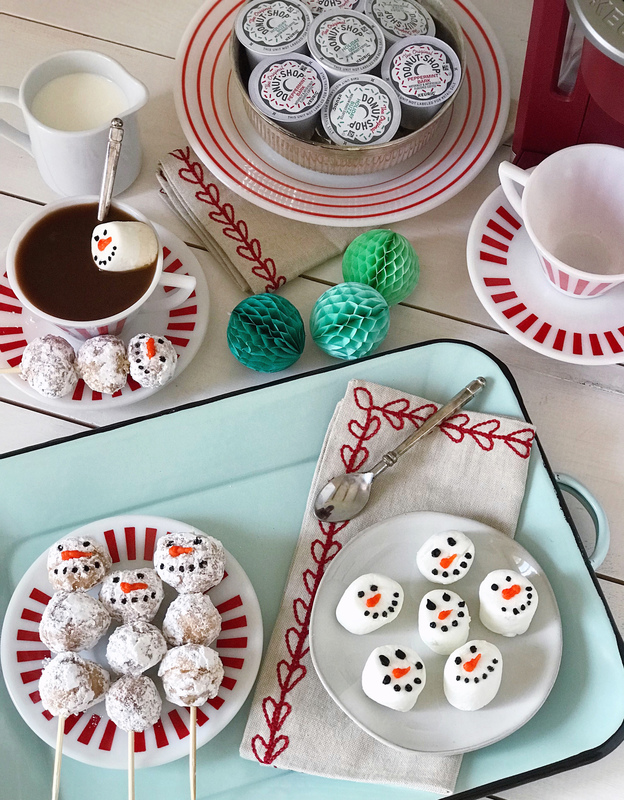 I love the labels on these, so festive (you could pair them with the new Keurig® K-Select™ coffee maker for a really nice holiday gift!). Guests can pick their favorite beverage varieties and then select their coffee strength using the Strong button to personalize their own drinks. 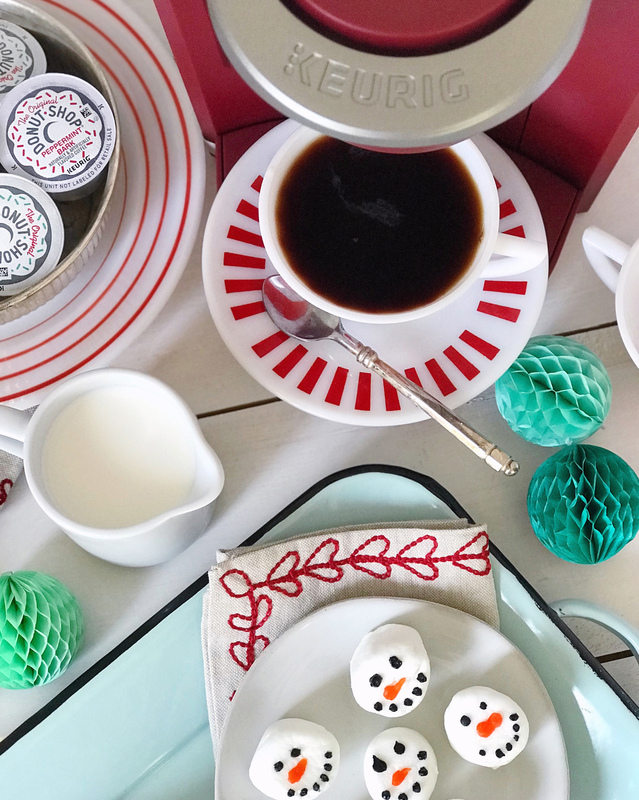 I also pulled out a set of my vintage red and white coffee cups and saucers; I love getting to use these this time of year! 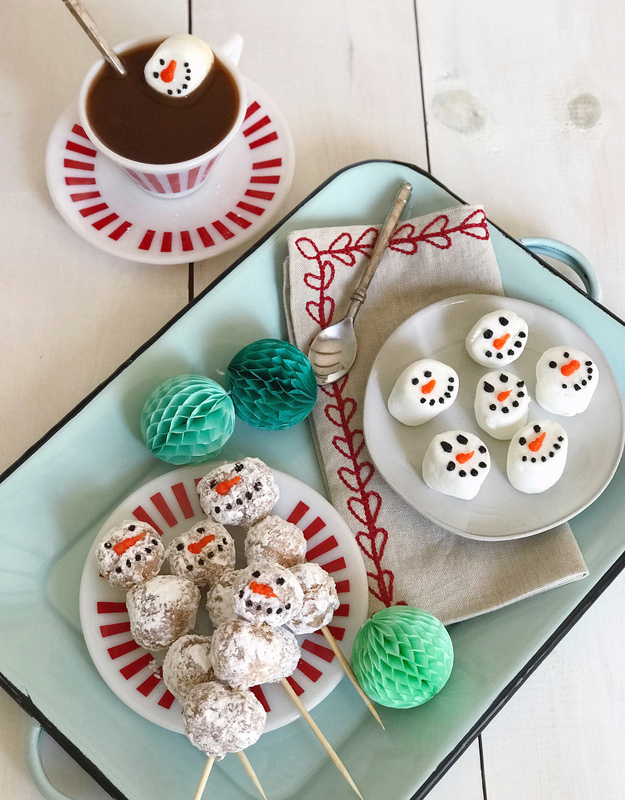 Alongside the coffee station, I made some winter-inspired sweet treats to go along with our drinks. Coffee and donuts go together like peanut butter and jelly, so I picked up a box of store-bought powdered donut holes for the coffee station. 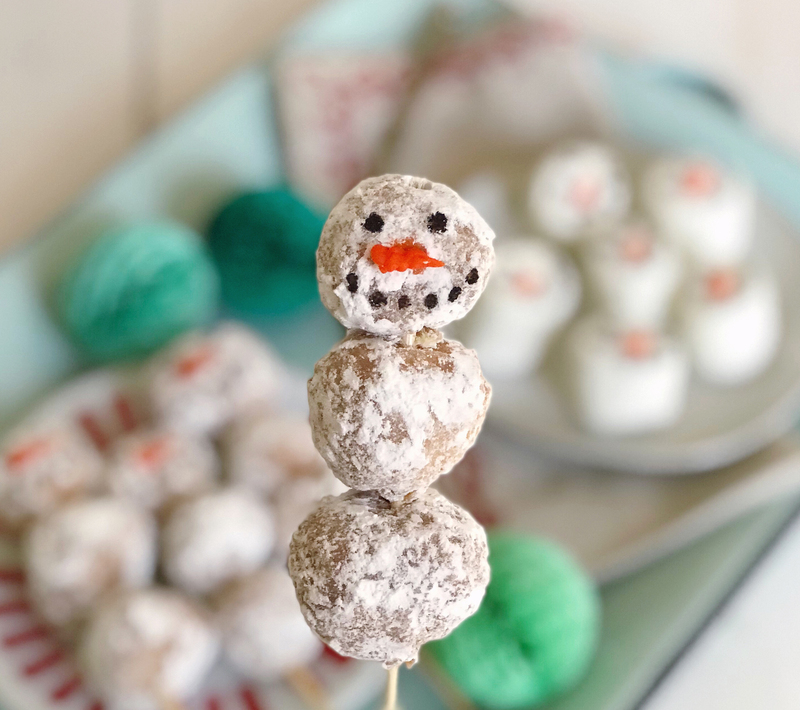 I took three donut holes and threaded them on bamboo skewers, and added little snowman faces to the top donut with icing. Black icing for the coal eyes and mouth, and of course a bit of orange icing for the carrot nose! 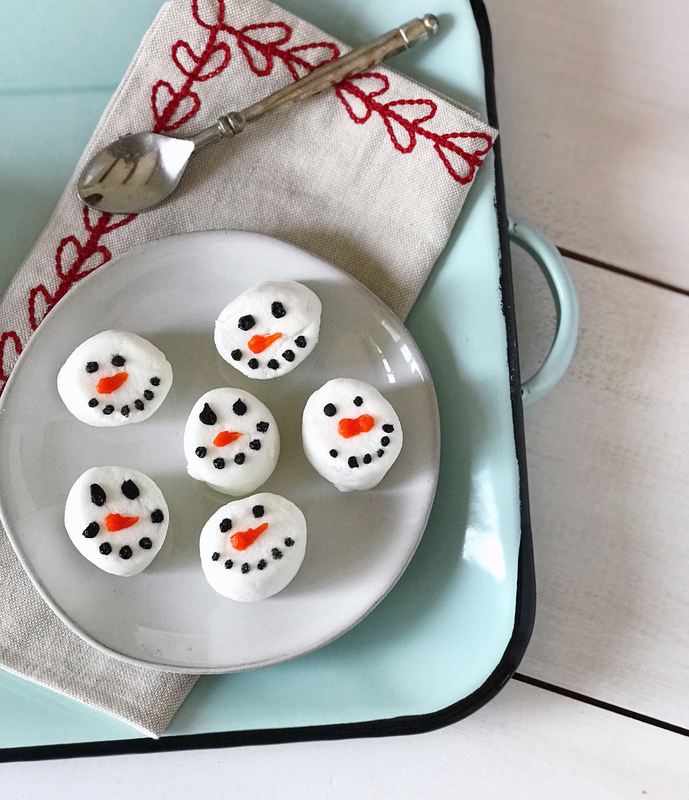 I used the same icing trick on a bag of jumbo marshmallows to serve on a plate with the warm drinks; I love this idea for serving with hot cocoa on a snow day, too. All that’s left to do is to build a fire, brew our coffee, and snack on some sweet and snowy treats when our family arrives! DIY Malachite Gift Tags and Giving Back With Garnet Hill. Hibernation Gifts.